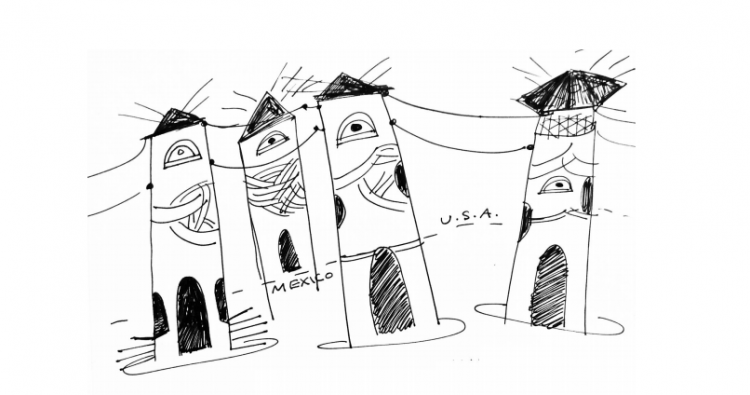 "A Wall of Lighthouses for the Border" prototype courtesy of J.M. 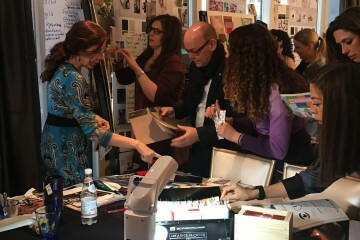 Design Studio. The President’s call for a wall along the 2,000-mile U.S.-Mexico border has been controversial from the outset, and the recent publication of proposals submitted to U.S. Customs and Border Protection has only broadened the possibilities for disagreement. Yet, as national media have published images and commentary from various proposal submissions, two groups of Pittsburgh designers have seized the national spotlight in completely opposite ways. One Pittsburgh design team has earned widespread praise for a series of resolutely fanciful proposals. Artist Jennifer Meridian initially registered with the government contractors website as a designer—J.M. Design Studio—simply to gather information about the border wall process and participants. But she was driven to action by outrage. “It was just so upsetting on so many levels,” she comments. She convened with fellow artists Tereneh Moseley and Leah Patgorski to brainstorm. “What kind of wall would you want?” asks Moseley. “We don’t want a wall.” The group elected to submit a series of conceptual proposals. “It became more like an art protest kind of submission,” Patgorski explains. Among other participants’ mockups of concrete walls and computer renderings of steel mesh barriers, the J.M. Design Studio team proposal is a series of quick sketches that a number of observers have described as whimsical. 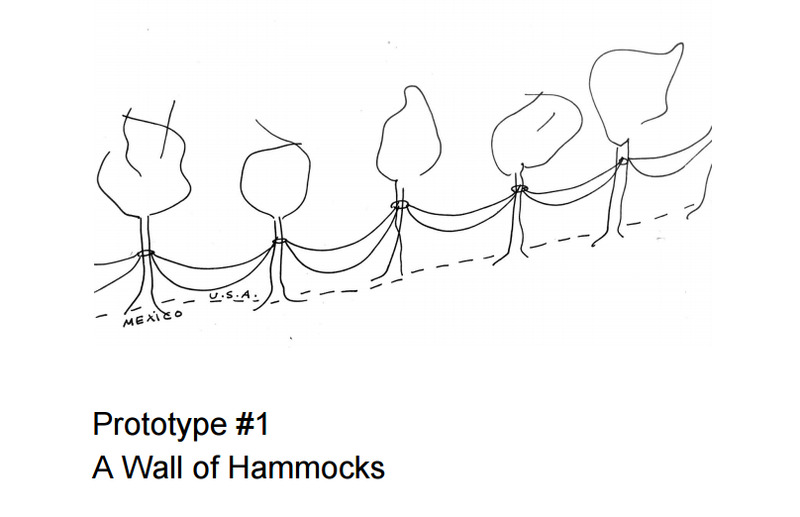 The self-explanatory “Wall of Hammocks” imagines the border as a place “to rest, relax and dream,” says the artists’ statement, which advocates for human rights and the end of prosecution of refugees. 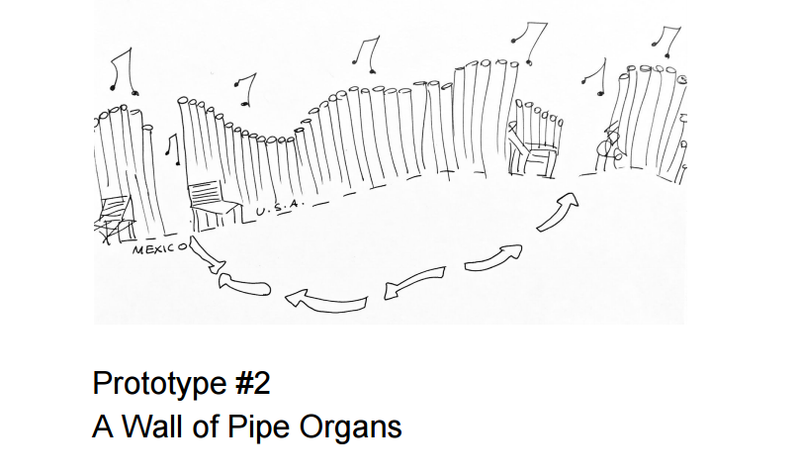 The “Wall of Pipe Organs” sticks to the letter of the 30-foot height requirement, but allows for openings every 20 feet or so, within the 10 million pipe organs needed to line the entire border. It uses the prospect of music as another means to cultivate joy rather than intimidation. Of course, these are not intended for construction, but “having someone in the Trump administration have to stop to think about these seemed like the right thing to do,” says Moseley. In fact, the audience has become much broader than originally anticipated. Meridian received an early inquiry from a reporter at the Center for Investigative Reporting at Berkeley, after which publicity seemed to multiply. The work has appeared in The Wall Street Journal and on the website for NPR, and it still seems to be bouncing around the internet. “Once it goes viral, other places just pick it up,” says Meridian. On the more straightforward end of the spectrum, Clayton Industries, a local firm engaging technologies for what their website describes as the “aerospace, defense, energy, material science, robotics, and waste industries,” proposes a multi-component barrier with networks of sensors within the government-stipulated 30-foot wall. The scheme features a 100-feet deep trench incorporating a waste-to-energy power plant and storage for nuclear waste. Railroad tracks provide an additional barrier in this scheme. Chicago Tribune architecture critic Blair Kamin singled out the Clayton Industries proposal as a “bizarre bad neighbor,” but it may be as much a publicity maneuver as a real proposal. 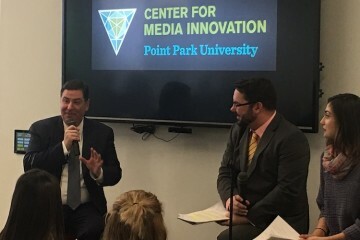 In published comments, a Clayton Industries spokesman (who otherwise declined to answer inquiries from NEXTpittsburgh) asked area media to look into proposals for waste-to-energy plants that the company submitted locally, though City and County officials quoted in the Pittsburgh Post-Gazette) have not acknowledged receipt of such proposals.